Forrest Gump. All of a sudden we’re in a different movie. Strings swell and crescendo, a Randy Newman-esque tune, telegraphing that we are in the 1920s, brings us to the sentimentally “tough” life of young immigrant Louis and his Italian family, trying to assimilate into this new country. The shot composition is gorgeous, the camera moves “smooth as butter.” The “Hollywood Feel Good Syndrome” has, like the Statue of Liberty greeting the huddled masses, powered through the scene, smashing and leaving clichés in its wake. 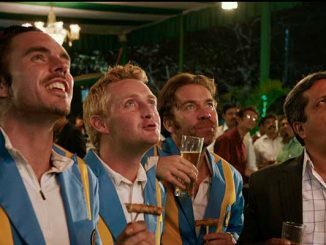 Louis and his brother Josh strive to better themselves, Mama chastises with a reprimanding finger, the boys are on the track team, girls flirt and roll their eyes, a sports announcer in the BG lists off Lou’s many accolades over a montage – where the hell are we? This nostalgic, soft focused backstory has just destroyed the sinew and powerful direction of the first 15 minutes. Everything the audience has been sold on, just got sold down the river. Unbroken is a big budget, marquee film with powerhouse packaging. Even before the “Sony Hack” revealed the inherent sexism that Angelina Jolie has had to endure, her name above the title as director helped echelon this project through the many red lights it would generally encounter on its way from development to production. Add to that the four writers involved include the Coen Brothers, as well as their “go to” Cinematographer Roger Deakins and a theme song performed by Coldplay, you have an event picture with “Oscar-bait” written all over it. So why did it fail to garner any Golden Globe nominations – especially when those tend to be the early Oscar indicators? Perhaps the Hollywood Foreign Press is not as easily romanced by the creaky, well-worn “Hollywood Feel Good” Tropes that Oscar almost always falls prey to. Or, it could be the schizophrenic nature of the film, which has lifted moments and scenes from a dozen other movies, that too easily show its “hand.” It’s as if director Jolie crammed before finals and binged on Forrest Gump, Saving Private Ryan, The Bridge Over the River Kwai, Stalag 17, Lifeboat, Papillion, Platoon; there’s too many – more than just “referenced” – but “lifted” in both staging and coverage — than one can list. Based on Laura Hillenbrand’s lauded biography of Louis Zamperini, Unbroken: A World War II Story of Survival, Resilience and Redemption, Jolie and writers took a very heavy-handed approach to telling a story that is already so fantastic, so amazing, it needed to be reined in, with a filmmaker at the helm who could pull back, and deliver some extremely subtle, atypical storytelling – rather than overload it with cliché melodrama. For the uninitiated, Zamperini went from a problem child to a star athlete and a participant in the 1936 Olympics in Berlin. From there, he became an Ace bombardier, crash landed in the ocean, survived for 47 days on a life raft, only to be rescued by the Japanese and at their hands, endure cruel torture and punishment throughout different POW camps until the end of the war. The travails and tragedies are piled onto Zamperini throughout, so that we see what it takes to, literally and figuratively, “break” a man. The main actors had to lose a large amount of weight to go from “strapping” young men to starved plane crash survivors and then beaten down and deprived prisoners; all within the span of two months. And as with Castaway, there’s no question that their physical transformation is awe-inspiring. At a recent Q&A, Director Jolie commented that she wanted to tell a story of spiritual transformation, not make it deal with heroes and villains in blacks and whites, but shaded greys. While it was fascinating to hear this, her description is not the film she ended up with. 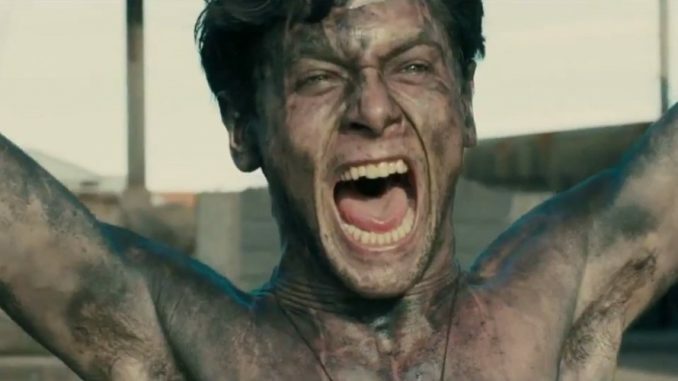 The Japanese are presented as snarling, lip curling super villains; and the personal spiritual “salvation” that Zamperini strove for, happens “off screen.” In fact, the biggest surprise is the movie’s post script which goes on for several minutes, attempting at the 11th hour to give context and explanation to the “awakening” that took place in Zamperini’s life. We even see news footage of the real man, in his 80s, that is supposed to offer greater believability and resonance, when in fact, it plays as a cheap attempt to get the waterworks flowing. To Jolie’s credit, there definitely are scenes of well-directed intensity. All of the air missions jettison any sentimentality and are handled with muscle and grit. The isolation, the physical tortures that Zamperini must endure are well lensed and choreographed. But as soon as Jolie has us in the palm of her hand, she pings back to soppy nostalgia, and again, the trust she built up is dashed. A most fascinating byproduct of Unbroken has more to do within the context of our country’s recent connection to torture and violent interrogation methods. Jolie and husband Brad Pitt are no strangers to global human rights violations. If there is a message to be drawn from the film, it’s that as easy as it is to vilify the Japanese, we have to take a long sobering look in the mirror and wonder what conditions we have forced prisoners of war to endure. Zamperini’s story is nothing less than astounding. It was originally attempted as a Tony Curtis vehicle in the 60s, which gives some idea how long it’s been kicking around. But Zamperini wasn’t yet finished, as evidenced by Hillenbrand’s book which tells a far richer biography of redemption and forgiveness than almost any standard prisoner of war tale would have covered 50 years ago. And according to Jolie, the war hero and Olympic athlete was able to view the film just a short time before he passed. With this type of pedigree, it’s almost a forgone conclusion that quality is not nearly as important as packaging. So, if you’re looking to be spoon fed inspiration in between moments heavily “borrowed” from other films, (and there are filmgoers who are happy to oblige), Unbroken will surely deliver all the necessary goodies you go to the movies for. If, however, you’re looking for a story of inspiration, told in an inspired way, you’d best read the book. Unbroken opens nationwide today, December 25th. For Your Consideration is a new feature that rounds-up and reviews late year entries that will probably hold some Oscar contention. Read the book, saw the movie, and you echo most of my thoughts about it. To me, the most fantastic part of the Zamperini story is the stuff that happened after he got back home, which the film tacks on the end. Clumsily, to my thinking.